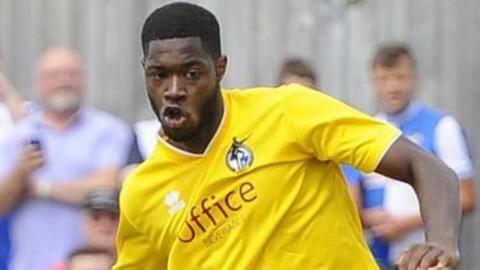 Torquay United, 22nd in the National League, edged a thrilling relegation battle with bottom club Kidderminster. Nathan Smith's overhead kick hit the bar and bounced in off luckless keeper Dean Snedker's back to give the Gulls an early lead before Nathan Blissett's towering header doubled the advantage. Kelvin Langmead then headed in before Arthur Gnahoua shot home the equaliser. But Smith poked in an 82nd-minute winner after a goalmouth scramble to earn Torquay's fourth successive win. It leaves the Gulls four points from safety with a game in hand, but Colin Gordon's Harriers are now 11 points off 20th-placed Boreham Wood with nine games left. Former Harriers striker Blissett's goal was his fourth in six games since arriving on loan from Bristol Rovers. Match ends, Torquay United 3, Kidderminster Harriers 2. Second Half ends, Torquay United 3, Kidderminster Harriers 2. Offside, Torquay United. Courtney Richards tries a through ball, but Courtney Richards is caught offside. Foul by Lewis Kinsella (Kidderminster Harriers). Attempt missed. Andre Wright (Torquay United) right footed shot from outside the box misses to the right. Substitution, Kidderminster Harriers. Omari Patrick replaces Zaine Francis-Angol. Substitution, Torquay United. Sam Chaney replaces Shaun Harrad. Zaine Francis-Angol (Kidderminster Harriers) wins a free kick. Goal! Torquay United 3, Kidderminster Harriers 2. Nathan Smith (Torquay United) header from the centre of the box to the high centre of the goal. Assisted by Dan Butler. Attempt saved. Arthur Gnahoua (Kidderminster Harriers) left footed shot from outside the box is saved. Shaun Harrad (Torquay United) wins a free kick. Andre Wright (Torquay United) wins a free kick. Attempt missed. Luke Maxwell (Kidderminster Harriers) left footed shot from outside the box. Assisted by Ben Whitfield. Offside, Torquay United. Shaun Harrad tries a through ball, but Shaun Harrad is caught offside. Attempt blocked. Kelvin Langmead (Kidderminster Harriers) header from the centre of the box is blocked. Assisted by Ben Whitfield. Attempt saved. Luke Maxwell (Kidderminster Harriers) header from the centre of the box is saved. Substitution, Torquay United. Andre Wright replaces Toby Ajala. Foul by Josh Rees (Torquay United). Goal! Torquay United 2, Kidderminster Harriers 2. Arthur Gnahoua (Kidderminster Harriers) left footed shot from outside the box to the bottom right corner. Attempt missed. Ben Whitfield (Kidderminster Harriers) right footed shot from outside the box misses to the left. Goal! Torquay United 2, Kidderminster Harriers 1. Kelvin Langmead (Kidderminster Harriers) header from the left side of the box to the top right corner. Assisted by Lewis Kinsella with a cross.